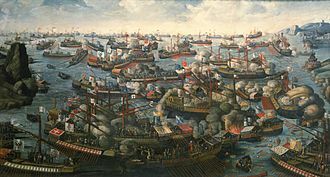 "Closed sea" redirects here. 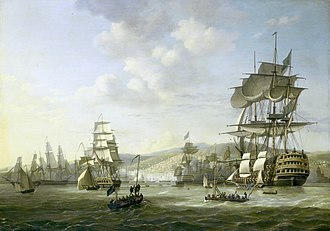 For the legal concept in opposition to 'freedom of the seas', see Mare clausum. An endorheic basin (also endoreic basin or endorreic basin) is a limited drainage basin that normally retains water and allows no outflow to other external bodies of water, such as rivers or oceans, but converges instead into lakes or swamps, permanent or seasonal, that equilibrate through evaporation. Such a basin may also be referred to as a closed or terminal basin or as an internal drainage system or interior drainage basin. Endorheic regions, in contrast to exorheic regions, which flow to the ocean in geologically defined patterns, are closed hydrologic systems. Their surface waters drain to inland terminal locations where the water evaporates or seeps into the ground, having no access to discharge into the sea. 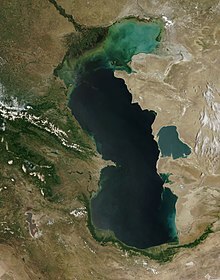 Endorheic water bodies include some of the largest lakes in the world, such as the Caspian Sea, the world's largest saline inland sea. Endorheic basins constitute local base levels, defining a limit of erosion and deposition processes of nearby areas. 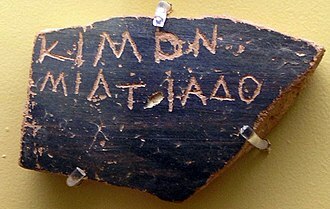 The term comes from the Ancient Greek: ἔνδον, éndon, "within" and ῥεῖν, rheîn, "to flow". Endorheic lakes are bodies of water that do not flow into the sea. Most of the water falling on Earth finds its way to the oceans through a network of rivers, lakes and wetlands. However, there is a class of water bodies that are located in closed or endorheic watersheds where the topography prevents their drainage to the oceans. 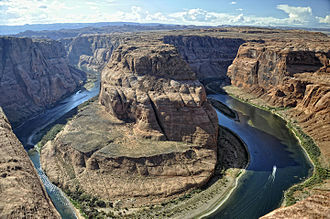 These endorheic watersheds (containing water in rivers or lakes that form a balance of surface inflows, evaporation and seepage) are often called terminal lakes or sink lakes. Endorheic lakes are usually in the interior of a landmass, far from an ocean in areas of relatively low rainfall. Their watersheds are often confined by natural geologic land formations such as a mountain range, cutting off water egress to the ocean. The inland water flows into dry watersheds where the water evaporates, leaving a high concentration of minerals and other inflow erosion products. 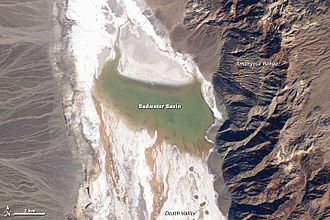 Over time this input of erosion products can cause the endorheic lake to become relatively saline (a "salt lake"). Since the main outflow pathways of these lakes are chiefly through evaporation and seepage, endorheic lakes are usually more sensitive to environmental pollutant inputs than water bodies that have access to oceans, as pollution can be trapped in them and accumulate over time. Endorheic regions can occur in any climate but are most commonly found in desert locations. In areas where rainfall is higher, riparian erosion will generally carve drainage channels (particularly in times of flood), or cause the water level in the terminal lake to rise until it finds an outlet, breaking the enclosed endorheic hydrological system's geographical barrier and opening it to the surrounding terrain. 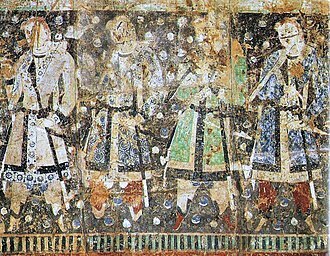 The Black Sea was likely such a lake, having once been an independent hydrological system before the Mediterranean Sea broke through the terrain separating the two. Lake Bonneville was another such lake, overflowing its basin in the Bonneville flood. The Malheur/Harney lake system in Oregon is normally cut off from drainage to the ocean, but has an outflow channel to the Malheur River that is normally dry, but flows in years of peak precipitation. Examples of relatively humid regions in endorheic basins often exist at high elevation. These regions tend to be marshy and are subject to substantial flooding in wet years. The area containing Mexico City is one such case, with annual precipitation of 850 mm (33 in) and characterized by waterlogged soils that require draining. Endorheic regions tend to be far inland with their boundaries defined by mountains or other geological features that block their access to oceans. Since the inflowing water can evacuate only through seepage or evaporation, dried minerals or other products collect in the basin, eventually making the water saline and also making the basin vulnerable to pollution. Continents vary in their concentration of endorheic regions due to conditions of geography and climate. Australia has the highest percentage of endorheic regions at 21 percent while North America has the least at five percent. 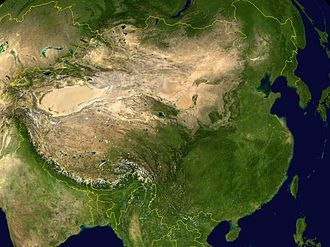 Approximately 18 percent of the earth's land drains to endorheic lakes or seas, the largest of these land areas being the interior of Asia. In deserts, water inflow is low and loss to solar evaporation high, drastically reducing the formation of complete drainage systems. Closed water flow areas often lead to the concentration of salts and other minerals in the basin. Minerals leached from the surrounding rocks are deposited in the basin, and left behind when the water evaporates. 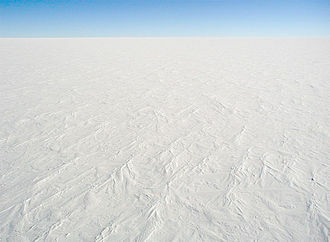 Thus endorheic basins often contain extensive salt pans (also called salt flats, salt lakes, alkali flats, dry lake beds or playas). These areas tend to be large, flat hardened surfaces and are sometimes used for aviation runways or land speed record attempts, because of their extensive areas of perfectly level terrain. Both permanent and seasonal endorheic lakes can form in endorheic basins. Some endorheic basins are essentially stable, climate change having reduced precipitation to the degree that a lake no longer forms. Even most permanent endorheic lakes change size and shape dramatically over time, often becoming much smaller or breaking into several smaller parts during the dry season. As humans have expanded into previously uninhabitable desert areas, the river systems that feed many endorheic lakes have been altered by the construction of dams and aqueducts. As a result, many endorheic lakes in developed or developing countries have contracted dramatically, resulting in increased salinity, higher concentrations of pollutants, and the disruption of ecosystems. Even within exorheic basins, there can be "non-contributing", low-lying areas that trap runoff and prevent it from contributing to flows downstream during years of average or below-average runoff. In flat river basins, non-contributing areas can be a large fraction of the river basin, e.g. Lake Winnipeg's basin. A lake may be endorheic during dry years and can overflow its basin during wet years, e.g., the former Tulare Lake. 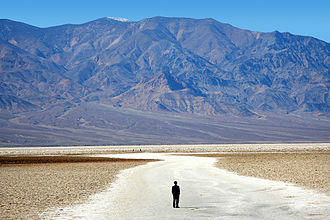 Because the Earth's climate has recently been through a warming and drying phase with the end of the Ice Ages, many endorheic areas such as Death Valley that are now dry deserts were large lakes relatively recently. During the last ice age, the Sahara may have contained lakes larger than any now existing. 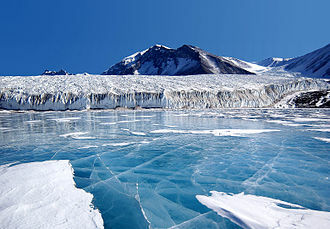 Endorheic lakes in Antarctica are located in the McMurdo Dry Valleys, Victoria Land, the largest ice-free area in Antarctica. Don Juan Pond in Wright Valley is fed by groundwater from a rock glacier and remains unfrozen throughout the year. 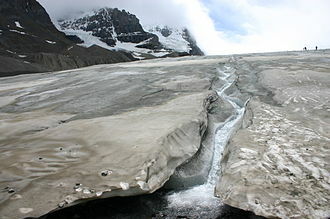 Lake Vanda in Wright Valley has a perennial ice cover, the edges of which melt in the summer allowing flow from the longest river in Antarctica, the Onyx River. The lake is over 70 m deep and is hypersaline. Lake Bonney is in Taylor Valley and has a perennial ice cover and two lobes separated by the Bonney Riegel. The lake is fed by glacial melt and discharge from Blood Falls. Its unique glacial history has resulted in a hypersaline brine in the bottom waters and fresh water at the surface. Lake Hoare, in Taylor Valley, is the freshest of the Dry Valley lakes receiving its melt almost exclusively from the Canada Glacier. The lake has an ice cover and forms a moat during the Austral summer. Lake Fryxell is adjacent to the Ross Sea in Taylor Valley. The lake has an ice cover and receives its water from numerous glacial meltwater streams for approximately 6 weeks out of the year. Its salinity increases with depth. The Caspian Sea, the largest lake on Earth. A large part of Eastern Europe, drained by the Volga River, is part of the Caspian's basin. Lake Urmia in Western Azerbaijan Province of Iran. The Aral Sea, whose tributary rivers have been diverted, leading to a dramatic shrinkage of the lake. The resulting ecological disaster has brought the plight faced by internal drainage basins to public attention. Issyk-Kul Lake, Son-Kul Lake, and Chatyr-Kul Lake in Kyrgyzstan. Lop Lake, in the Tarim Basin of China's Xinjiang Uygur Autonomous Region. 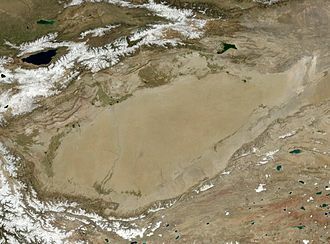 The Dzungarian Basin in Xinjiang, separated from the Tarim Basin by the Tian Shan. 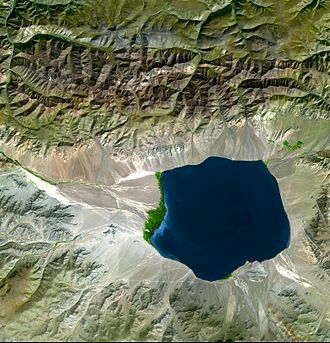 The most notable terminal lake in the basin is the Manas Lake. The Central Asian Internal Drainage Basin, in southern and western Mongolia, contains a series of closed drainage basins, such as the Khyargas Nuur basin, the Uvs Nuur basin, which includes Üüreg Lake, and the Pu-Lun-To River Basin. Qaidam Basin, in Qinghai Province, China, as well as nearby Qinghai Lake. Many small lakes and rivers of the Iranian Plateau, including Gavkhouni marshes and Namak Lake. The Dead Sea, the lowest surface point on Earth and one of its saltiest bodies of water, lies between Israel and Jordan. Sabkhat al-Jabbul, extensive salt flats and a 100 square kilometres (39 sq mi) lake in Syria. Solar Lake, Sinai, near the Israeli-Egypt border. Lake Tuz, in Turkey, in south part of Central Anatolia Region. Sawa lake in Iraq, in Muthanna Governorate. Lake Eyre Basin, which drains into the highly variable Lake Eyre and includes Lake Frome. *Lake Torrens, usually endorheic lake to the west of the Flinders Ranges in South Australia (*flows to the sea after extreme rainfall events). Lake Corangamite, a highly saline crater lake in western Victoria. Chad Basin, in the northern center of Africa. It covers an area of approximately 2.434 million km2. Chott el Djerid, in Tunisia. The Okavango River, in the Kalahari Desert, is part of an endorheic basin region that also includes the Okavango Delta, Lake Ngami, the Nata River, and a number of salt pans such as Makgadikgadi Pan. Etosha pan in Namibia's Etosha National Park. Turkana Basin, in Kenya, whose basin includes the Omo River of Ethiopia. Some Rift Valley lakes, such as Lake Abijatta, Lake Chew Bahir, Lake Shala, Lake Chamo, and Lake Awasa. Lake Mweru Wantipa, in Zambia. The Great Basin is North America's largest and the world's third largest endorheic basin, covering nearly all of Nevada, much of Oregon and Utah, and portions of California, Idaho, and Wyoming. Notable enclosed basins include Death Valley, the hottest location on Earth; the Black Rock Desert and Bonneville Salt Flats, locations of every new vehicle land speed record set since the 1930s; the Great Salt Lake, remnant of Lake Bonneville; and the Salton Sea. The Valley of Mexico. In Pre-Columbian times, the Valley was substantially covered with five lakes, including Lake Texcoco, Lake Xochimilco, and Lake Chalco. Guzmán Basin, in northern Mexico and the southwestern United States. The Mimbres River of New Mexico drains into this basin. Lago de Atitlán, in the highlands of Guatemala. Bolsón de Mapimí, in northern Mexico. Willcox Playa of southern Arizona. Tulare Lake in the southern end of the San Joaquin Valley fed by the Kaweah and Tule Rivers plus southern distributaries of the Kings. Historically, in very wet years it would drain into the San Joaquin River. Agricultural development and irrigation diversions have left the lake dry. Buena Vista Lake at the southmost end of the San Joaquin Valley fed by the Kern River. Historically, in exceptionally wet years it would drain into Tulare Lake and then into the San Joaquin River. Agricultural development and irrigation diversions have left the lake dry. Crater Lake, in Oregon. It is filled directly by rain and snow, and so has very little mineral or salt buildup. The Great Divide Basin in Wyoming, a small endorheic basin that straddles the Continental Divide of the Americas. Devils Lake, in North Dakota. Tule Lake and the Lost River basin in California and Oregon. Little Manitou Lake in Saskatchewan. Old Wives Lake, on the Laurentian Divide in Saskatchewan. Pakowki Lake, on the Laurentian Divide in Alberta. Spotted Lake, Osoyoos, British Columbia, Canada. Frame Lake in Yellowknife, capital of Canada's Northwest Territories. Lago Enriquillo on the island of Hispaniola in the Caribbean Sea. Many small lakes and ponds in North Dakota and the Northern Great Plains are endorheic; some of them have salt encrustations along their shores. Lake Neusiedl, in Austria and Hungary. Fucine Lake, in Italy. Now drained. Lake Prespa, between Albania, Greece and North Macedonia. Rahasane turlough, the largest turlough in Ireland. The Lasithi Plateau in Crete, Greece, is a high endorheic plateau. All these lakes are drained, however, either through manmade canals or via karstic phenomena. Minor endorheic lakes exist throughout the Mediterranean countries of Spain (e.g. 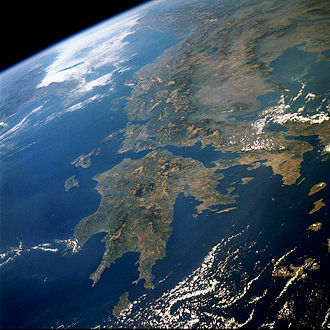 Laguna de Gallocanta, Estany de Banyoles), Italy, Cyprus (Larnaca and Akrotiri salt lakes) and Greece. Lake Mar Chiquita in Argentina. 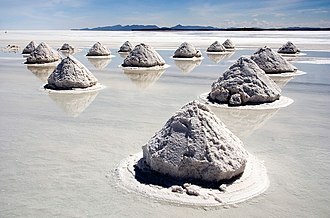 The Altiplano includes a number of closed basins such as the Salar de Coipasa, and Titicaca–Poopó system. Salar de Atacama, in the Atacama Desert, Chile. The Black Sea, until its merger with the Mediterranean. 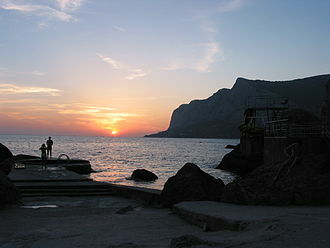 The Mediterranean Sea itself and all its tributary basins, during its Messinian desiccation (approximately five million years ago) as it became disconnected from the Atlantic Ocean. The Orcadian Basin in Scotland during the Devonian period. Now identifiable as lacustrine sediments buried around and off the coast. Lake Tanganyika in Africa. 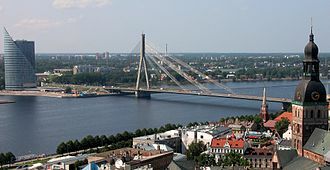 Currently high enough to connect to rivers entering the sea. Lake Lahontan in North America. Lake Bonneville in North America. Basin was not always endorheic; at times it overflowed through Red Rock Pass to the Snake River and the sea. Lake Chewaucan in North America. Tularosa Basin and Lake Cabeza de Vaca in North America. The basin was formerly much larger than at present, including the ancestral Rio Grande north of Texas, feeding a large lake area. Ebro and Duero basins, draining most of northern Spain during the Neogene and perhaps Pliocene. Climate change and erosion of the Catalan coastal mountains, as well as deposition of alluvium in the terminal lake, allowed the Ebro basin to overflow into the sea during the middle-to-late Miocene. ^ "Inland water ecosystem". Encyclopædia Britannica. Retrieved 11 June 2018. ^ a b c "Endorheic Lakes: Waterbodies That Don't Flow to the Sea". United Nations Environment Programme. Archived from the original on 2007-09-27. Retrieved 2008-02-11. ^ Goudie, A.S. (2004). "Base level". In Goudie, A.S. Encyclopedia of Geomorphology. Routledge. p. 62. ^ "What is a watershed and why should I care?". University of Delaware. Archived from the original on 2008-03-09. Retrieved 2008-02-11. ^ National Research Council Staff (1995). Mexico City's Water Supply: Improving the Outlook for Sustainability. Washington, D.C., USA: National Academies Press. ISBN 978-0-309-05245-0. ^ Saline Lake Ecosystems of the World. Springer. 1986-04-30. ISBN 978-90-6193-535-3. Retrieved 2007-07-31. ^ "Archived copy" (PDF). Archived (PDF) from the original on 2017-01-19. Retrieved 2017-08-27. CS1 maint: Archived copy as title (link), p 2. ^ "The Sahara Megalakes Project". King's College London. Archived from the original on 13 July 2015. Retrieved 11 July 2015. ^ "Basins". Mongolian River Resources. Archived from the original on 15 March 2012. Retrieved 21 November 2010. ^ Houghton, Samuel G. (1994). A trace of desert waters: the Great Basin story. Reno: University of Nevada Press. ^ "BC Geographical Names". apps.gov.bc.ca. Archived from the original on 16 March 2016. Retrieved 8 May 2018. Look up endorheic in Wiktionary, the free dictionary. Lake Bonneville was a prehistoric pluvial lake that covered much of the eastern part of North Americas Great Basin region. Most of the territory it covered was in present-day Utah, though parts of the lake extended into present-day Idaho and Nevada. Formed about 32,000 years ago, Lake Bonneville existed until about 14,500 years ago, following the Bonneville Flood, as the release is now known, the lake receded to a level called the Provo Level. Many of the geological characteristics of the Great Basin are due to the effects of the lake. At more than 1,000 ft deep and more than 19,691 square miles in area, with the change in climate, the lake began drying up, leaving Great Salt Lake, Utah Lake, Sevier Lake, Rush Lake, and Little Salt Lake as remnants. Bonneville was noted for his expeditions to the Oregon Country and the Great Basin, the lake was probably not a singular entity either, geologic evidence suggests that it may have evaporated and reformed as many as 28 times in the last 800,000 years. 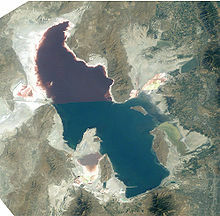 Great Salt Lake, Utah Lake, and Sevier Lake are the largest remnants of the original Lake Bonneville, several levels of the old shorelines are still visible above Salt Lake City, along the Wasatch Front and elsewhere. The appearance of the shorelines is that of a shelf or bench protruding from the mountainside, four main shorelines are associated with the fluctuating levels of the ancient lake. The Stansbury, Bonneville and Gilbert shorelines each mark a time when lake level remained constant long enough to deposit massive accumulations of sand, the Bonneville Bench, at about 5,102 feet above sea level, is part of the preserved ice age shoreline. This shoreline marks the highest level attained by the Pleistocene lake approximately 15,500 years ago, during this period, the lake covered over 20,000 sq mi and was over 980 ft deep in places. About 14,500 years ago, the level fell catastrophically as Lake Bonneville overflowed near Red Rock Pass, Idaho. The lake level fell some 344 ft to what is now the lower bench in a flood that geologists estimate to have lasted up to a year. Hydrology is the scientific study of the movement and quality of water on Earth and other planets, including the water cycle, water resources and environmental watershed sustainability. A practitioner of hydrology is a hydrologist, working within the fields of earth or environmental science, physical geography, geology or civil, Hydrology subdivides into surface water hydrology, groundwater hydrology, and marine hydrology. Domains of hydrology include hydrometeorology, surface hydrology, drainage-basin management and water quality and meteorology are not included because water is only one of many important aspects within those fields. Hydrological research can inform environmental engineering and planning, the term hydrology comes from Greek, ὕδωρ, hýdōr, and λόγος, lógos, study. Chemical hydrology is the study of the characteristics of water. Ecohydrology is the study of interactions between organisms and the hydrologic cycle, hydrogeology is the study of the presence and movement of groundwater. Hydroinformatics is the adaptation of technology to hydrology and water resources applications. Hydrometeorology is the study of the transfer of water and energy between land and water surfaces and the lower atmosphere. Isotope hydrology is the study of the signatures of water. Surface hydrology is the study of processes that operate at or near Earths surface. Drainage basin management covers water-storage, in the form of reservoirs, water quality includes the chemistry of water in rivers and lakes, both of pollutants and natural solutes. Determining the water balance of a region and predicting flood and drought risk. Real-time flood forecasting and flood warning, designing irrigation schemes and managing agricultural productivity. Part of the module in catastrophe modeling. Designing dams for water supply or hydroelectric power generation, designing sewers and urban drainage system. Analyzing the impacts of antecedent moisture on sanitary sewer systems, predicting geomorphologic changes, such as erosion or sedimentation. 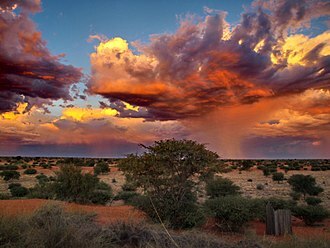 The Kalahari Desert is a large semi-arid sandy savannah in Southern Africa extending 900,000 square kilometres, covering much of Botswana, parts of Namibia, and regions of South Africa. Derived from the Tswana word Kgala, meaning the great thirst, or Kgalagadi, meaning a waterless place, drainage is by dry valleys, seasonally inundated pans, and the large salt pans of the Makgadikgadi Pan in Botswana and Etosha Pan in Namibia. The only permanent river, the Okavango, flows into a delta in the northwest, ancient dry riverbeds—called omuramba—traverse the central northern reaches of the Kalahari and provide standing pools of water during the rainy season. A semi-desert, with tracts of excellent grazing after good rains. There are small amounts of rainfall and the temperature is very high. The driest areas usually receive 110–200 millimetres of rain per year, the surrounding Kalahari Basin covers over 2,500,000 square kilometres extending further into Botswana and South Africa, and encroaching into parts of Angola and Zimbabwe. The Kalahari is home to migratory birds and animals. 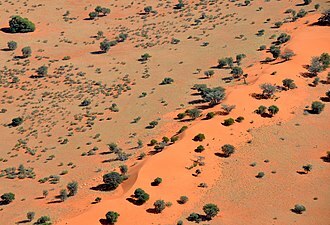 The area is now heavily grazed and cattle fences restrict the movement of wildlife, among deserts of the Southern Hemisphere, the Kalahari most closely resembles some Australian deserts in its latitude and its mode of formation. The Kalahari Desert came into existence approximately sixty years ago along with the formation of the African continent. 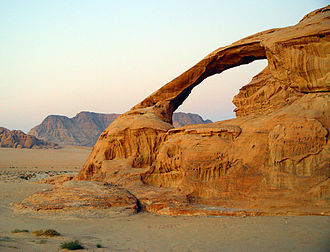 North and east, approximately where the dry forests and salt lakes prevail and west, where the vegetation is predominantly xeric savanna or even a semi-desert, the climate is Kalaharian semi-arid. The Kalaharian climate is subtropical, and is semi-arid with the dry season during the cold season and it is the southern tropical equivalent of the Sahelian climate. For example, winter frost is common from June to August, as in the Sahel, the wet season in the Kalahari is during the six coldest months of the year. 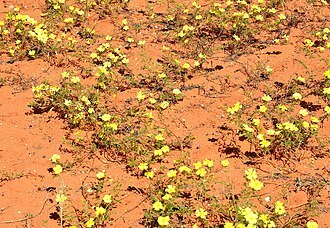 The dry season lasts eight months or more, and the wet season typically from less than one month to four months, the southwestern Kalahari is the driest area, in particular a small region located towards the west-southwest of Tsaraxaibis. 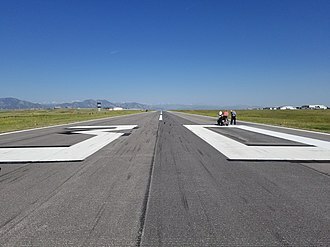 According to the International Civil Aviation Organization, a runway is a defined rectangular area on a land aerodrome prepared for the landing and takeoff of aircraft. 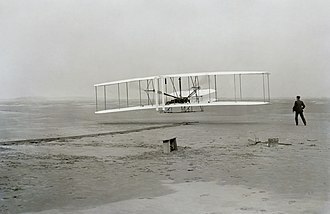 Runways may be a surface or a natural surface. Runways are named by a number between 01 and 36, which is generally the magnetic azimuth of the heading in decadegrees. This heading differs from true north by the magnetic declination. A runway numbered 09 points east, runway 18 is south, runway 27 points west, when taking off from or landing on runway 09, a plane would be heading 90°. 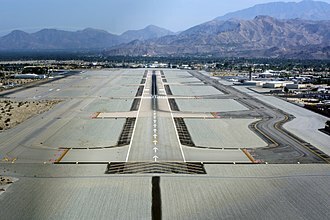 A runway can normally be used in both directions, and is named for each separately, e. g. runway 33 in one direction is runway 15 when used in the other. The two numbers usually differ by 18, Runway Zero Three Left becomes Runway Two One Right when used in the opposite direction. In some countries, if parallel runways are too close to each other, at large airports with four or more parallel runways some runway identifiers are shifted by 10 degrees to avoid the ambiguity that would result with more than three parallel runways. For example, in Los Angeles, this results in runways 6L, 6R, 7L. At Dallas/Fort Worth International Airport, there are five parallel runways, named 17L, 17C, 17R, 18L, for clarity in radio communications, each digit in the runway name is pronounced individually, runway three six, runway one four, etc. A leading zero, for example in runway zero six or runway zero one left, is included for all ICAO, most U. S. civil aviation airports drop the leading zero as required by FAA regulation. This includes some military airfields such as Cairns Army Airfield and this American anomaly may lead to inconsistencies in conversations between American pilots and controllers in other countries. It is very common in a such as Canada for a controller to clear an incoming American aircraft to, for example, runway 04. In flight simulation programs those of American origin might apply U. S. usage to airports around the world, for example, runway 05 at Halifax will appear on the program as the single digit 5 rather than 05. Iron-rich hypersaline water sporadically emerges from small fissures in the ice cascades. The saltwater source is a pool of unknown size overlain by about 400 metres of ice several kilometers from its tiny outlet at Blood Falls. 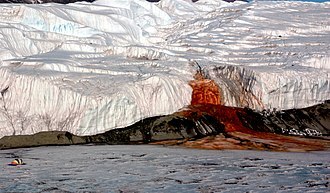 The reddish deposit was found in 1911 by the Australian geologist Griffith Taylor, the Antarctica pioneers first attributed the red color to red algae, but it was proven to be due to iron oxides. Poorly soluble hydrous ferric oxides are deposited at the surface of ice after the ferrous ions present in the unfrozen saltwater are oxidized in contact with atmospheric oxygen. As a consequence, the seawater was concentrated in brines with a salinity two to three times that of the mean ocean water. The analyses of stable isotopes of water allow, in principle, hypersaline fluid, sampled fortuitously through a crack in the ice, was oxygen-free and rich in sulfate and ferrous ion. Chemical and microbial analyses both indicate that a rare subglacial ecosystem of autotrophic bacteria developed that metabolizes sulfate and ferric ions, according to geomicrobiologist Jill Mikucki at the University of Tennessee, water samples from Blood Falls contained at least 17 different types of microbes, and almost no oxygen. The McMurdo Dry Valleys are a row of snow-free valleys in Antarctica located within Victoria Land west of McMurdo Sound. The Dry Valleys experience extremely low humidity and surrounding mountains prevent the flow of ice from nearby glaciers, the rocks here are granites and gneisses, and glacial tills dot this bedrock landscape, with loose gravel covering the ground. The region is one of the worlds most extreme deserts, and includes many features including Lake Vida, a lake, and the Onyx River. The Dry Valleys are so named because of their extremely low humidity and they are dry because, in this location, the mountains are sufficiently high that they block seaward flowing ice from the East Antarctic ice sheet from reaching the Ross Sea. At 4,800 square kilometres, the valleys constitute around 0. 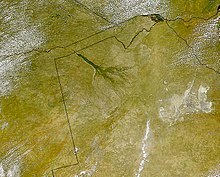 03% of the continent, the valley floors are covered with loose gravel, in which ice wedge polygonal patterned ground may be observed. 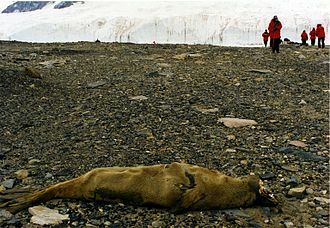 The unique conditions in the Dry Valleys are caused, in part, by katabatic winds, the winds can reach speeds of 320 kilometres per hour, heating as they descend, and evaporating all water and snow. The valleys cut through the Beacon Supergroup, as well as older granites and gneisses of the Ross Orogeny, deposited directly from ice, tills dot this bedrock landscape. These are relatively thin and patchy, and differ markedly from the extensive, endolithic photosynthetic bacteria have been found living in the Dry Valleys, sheltered from the dry air in the relatively moist interior of rocks. Summer meltwater from the glaciers provides the source of soil nutrients. Scientists consider the Dry Valleys perhaps the closest of any terrestrial environment to the planet Mars, anaerobic bacteria whose metabolism is based on iron and sulfur live in sub-freezing temperatures under the Taylor Glacier. It was previously thought that the algae was staining red the ice emerging at Blood Falls and they found no living organisms in the permafrost, the first location on the planet visited by humans with no active microbial life. Part of the Valleys was designated a protected area in 2004. Alatna Valley is the northernmost, north of Benson Glacier, the most saline of all is small Don Juan Pond. In earth science, erosion is the action of surface processes that remove soil, rock, or dissolved material from one location on the Earths crust, transport it away to another location. Eroded sediment or solutes may be transported just a few millimetres, the rates at which such processes act control how fast a surface is eroded. Feedbacks are possible between rates of erosion and the amount of eroded material that is carried by, for example. Processes of erosion that produce sediment or solutes from a place contrast with those of deposition, while erosion is a natural process, human activities have increased by 10-40 times the rate at which erosion is occurring globally. At well-known agriculture sites such as the Appalachian Mountains, intensive farming practices have caused erosion up to 100x the speed of the rate of erosion in the region. 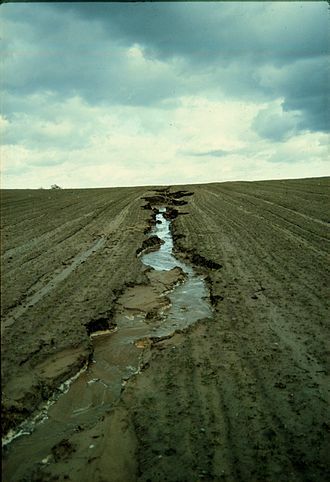 Excessive erosion causes both on-site and off-site problems, on-site impacts include decreases in agricultural productivity and ecological collapse, both because of loss of the nutrient-rich upper soil layers. In some cases, the end result is desertification. Off-site effects include sedimentation of waterways and eutrophication of bodies, as well as sediment-related damage to roads. Intensive agriculture, roads, anthropogenic climate change and urban sprawl are amongst the most significant human activities in regard to their effect on stimulating erosion, there are many prevention and remediation practices that can curtail or limit erosion of vulnerable soils. Rainfall, and the surface runoff which may result from rainfall, produces four types of soil erosion, splash erosion, sheet erosion, rill erosion. Splash erosion is generally seen as the first and least severe stage in the erosion process. In splash erosion, the impact of a falling raindrop creates a crater in the soil. The distance these soil particles travel can be as much as 0.6 m vertically and 1.5 m horizontally on level ground. If the soil is saturated, or if the rate is greater than the rate at which water can infiltrate into the soil. The base level of a river or stream is the lowest point to which it can flow, often referred to as the mouth of the river. For large rivers, sea level is usually the base level, all rivers and streams erode toward sea level, which is known as the ultimate base level. A rather rare exception can be seen in the Jordan River, if a river is dammed, a new base level replaces the ultimate base level. As a result, the base level is raised. Consequently, this reduces the velocity, leads to deposition. Base level is significant for subsurface drainage, a low base level is a prerequisite for the formation of karst topography, a network of sinkholes and caverns that can develop as slightly acidic groundwater enlarges joints in limestone rock. Often this network of underground drainage feeds back to surface drainage along the edges of larger rivers, which are the effective base level. When erosion has acted for a geologic time, wearing down the high points. Mature stream valleys have gentle slopes, rounded higher points and meandering courses, a very hard layer of rock can form a temporary base level, until it is cut through. 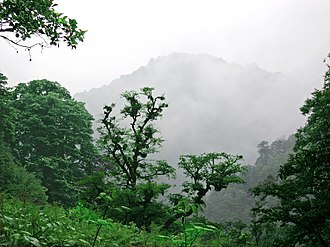 Iran's northern Caspian Hyrcanian mixed forests are maintained by moisture captured from the Caspian Sea by the Alborz Mountain Range. Illustration of two Caspian tigers, extinct in the region since the 1970s. Riparian zone along Trout Creek in the Trout Creek Mountains, part of the Burns Bureau of Land Management District in southeastern Oregon. The creek provides critical habitat for trout. 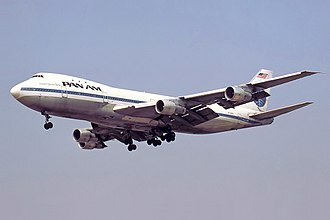 The Boeing 747, one of the most iconic aircraft in history. NASA's Helios researches solar powered flight. McMurdo Dry Valleys, Landsat 7 imagery acquired on December 18, 1999. 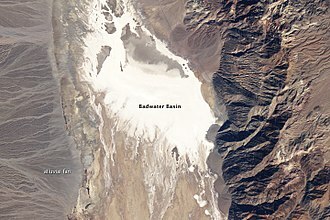 ASTER image of the Dry Valleys. Astronaut's photo of Bakhtegan and Maharloo salt lakes near Shiraz, Iran. 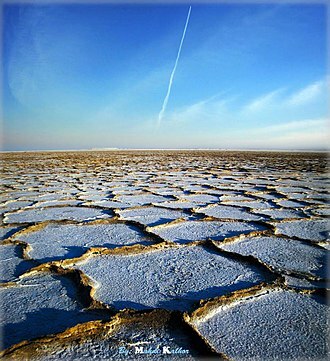 Salt lakes are particularly common in Iran. ThrustSSC, driven by Royal Air Force pilot Andy Green, holds the land speed record. A schematic cross-section of Blood Falls showing how subglacial microbial communities have survived in cold, darkness, and absence of oxygen for a million years in brine water below Taylor Glacier. One of the buildings located at the nearby camp. Water covers 70% of the Earth's surface.